Kitchen cabinets represent a large visual part of your kitchen. We’re not talking about function at this point. Functionality can be optimized by the designer using any cabinet style. We’re referring to personality. Your personality as it’s reflected in your choice of cabinets. Always discuss your cabinet options with your local kitchen remodelling contractor. They will be familiar, through installation and feedback experience of which cabinet seem to last and perform as expected. So taking it to the next step, you’ll need to identify (if you haven’t already) your personal style. We all have one, but unless you define it in “kitchen cabinet terms,” you won’t be able to narrow down the selection. There are of course subsets to all these kitchen cabinet style categories, but this will at least eliminate some of the contenders. Many modern kitchen designs reflect the need to blend the modern with the traditional. This is result of the need to update an older home style with a modern kitchen without creating a wide disjunction between the cabinet and kitchen style of the old or existing home and the new kitchen style. Great care must be taken when doing a transitional style kitchen. Cabinet choices can make or break the final look. If not done carefully – by a skilled designer – you’ll end up with a kitchen which looks like it was installed in the wrong house! And we’ve seen too many of those! The whole endeavor of choosing the perfect kitchen cabinet for your remodel comes down to knowing what you need to consider in detail. The best way to organize your thoughts is in a checklist. Always use checklists when it comes to a large project like remodelling your kitchen. Your kitchen design and installation contractor will invariably have their own checklists. Your job is on the front end. During the design and decision making process. Below is a list of things to consider when you’re looking at cabinets. 1. 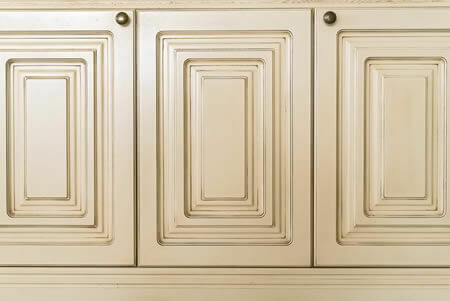 The overall color of the cabinets – even if they have differentiated hughes and designs, there’s an overall color tone by which one could describe the cabinets. In some cases your kitchen designer may even mix cabinet styles and colors. 2. Any distinctive patterns or accent styles on the cabinet doors, frames or filler cabinet faces. 3. Door Styles – like raised or center panel, with distinct contours and profiles. You may end up chosing streamlined flat slab doors for a contemporary cabinet design. 4. 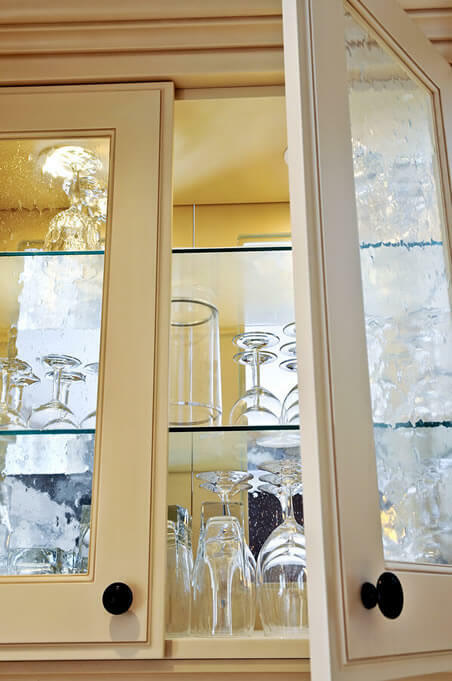 Glass Inserts – smoked glass, or clear glass cabinet door inserts. 5. 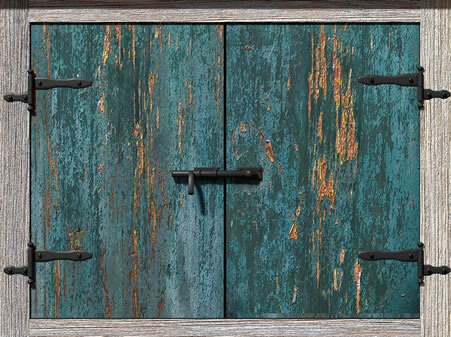 Cabinet Door Materials – wood cabinet doors can range from very traditional to very modern, depending on the wood, the finish and the style. 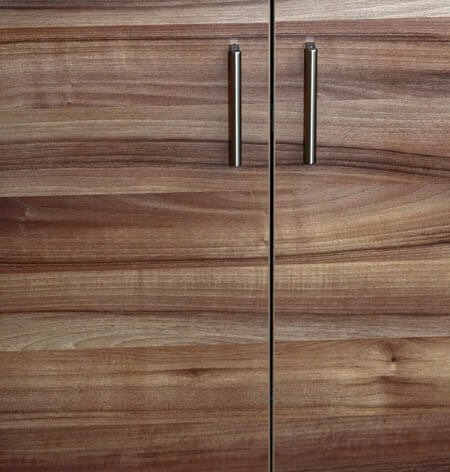 Popular cabinet door woods include pine, oak, hickory and cherry. Plus many other exotic woods used by kitchen cabinet makers. 6. 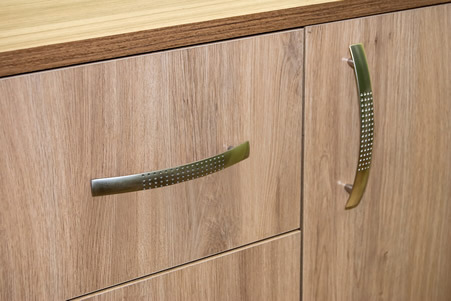 Hinge Styles – they can be hidden Euro cabinet hinges or traditional exposed hinges, but updated to be self closing. The four basic hinge types include (a) overlay (b) full inset (c) partial inset (d) offset. Without going into a detailed explanation of these, your options will be clear once you’ve narrowed down your overall cabinet door styled man made materials resulting in anything from a textured look high gloss. For example, cabinet doors can be laminated or thermofoil, or wood. 7. 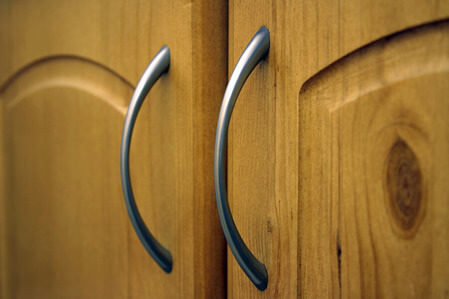 Cabinet Hardware – your choice of hardware is also almost endless. You can match anything from turn of the century hardware styles or introduce the most modern hidden hardware configurations – and everything in between. Your choice of hardware will follow your choice of cabinet style. After having decided on your overall kitchen cabinet style, you’ll have to work with your designer to customize the functionality of your cabinets based on your usage, storage and space availability needs. In this respect, you’ll need to create another kitchen cabinet checklist. Do you need to store and regularly access your kitchen gadgets? 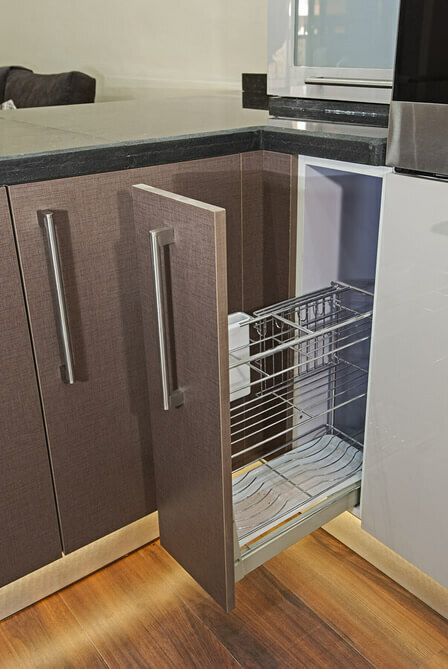 Based on the number of portable or hand held kitchen tools and small appliances you use – and the frequency at which you use them – will become an important consideration in your choice of cabinet type, location, internal cabinet space allocation and access points through doors and drawers. Do you maintain a large selection of pantry supplies? Depending on the type of inventory – like large cans, jugs or jars – and the volume of inventory you use and need to access regularly, your kitchen pantry location, size and access will need to be carefully thought through with your kitchen designer. This includes making room for your spice rack if you use one. Whether your spices will live in an enclosed spice rack, spice drawer or dedicated spice cabinet, you’ll have to give it some thought. Would you like to install a wine cabinet or rack? This will need to be accounted for as well when preparing your kitchen design layout plan. Where and how would you like to store your pots and pans? Depending on the number of pots and pans you have, the frequency of their use you’ll have to decide where they will be stored. Depending on the amount of space you have, you may opt to hang some pots overhead, store them in a lower cabinet unit, dedicate a wall cabinet to pots and pans and store them on the shelf, or install open shelving on a cabinet wall and leave them visible. Are you planning to accomodate people in the kitchen while cooking? Modern lifestyles tend to blend cooking with social activities, and not just with guests, but within the family. This makes considering extra seating and the use of islands important part of overall kitchen design and remodelling. Whether a kitchen cabinet layout for an island is dedicated to food preparation or company, think of its primary function. Trying to meet both needs will result in under serving both purposes. For example. If you allocate room for two tiny stools and only a little counter space, your cooking guests won’t stay long – and you won’t have enough counter space dedicated to cooking either. Have you considered the need to clean the cabinets? The more intricate your kitchen cabinets are, the harder they are to keep clean. The little corners within the door and cabinet profiles will accumulate dirt and grease floating in the air and will be quite a chore to keep clean. 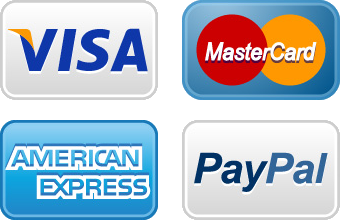 Do you have specific appliances in mind? Your appliance choices will also govern the layout of your cabinets. Some refrigerators can be built in to kitchen cabinetry, others cannot, but require very specific space allocation for a proper fit. 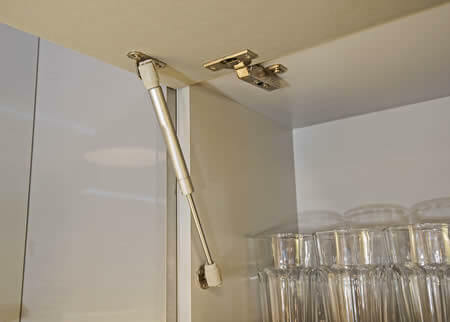 The same general rule of space allocation in cabinets when it comes to fitting stoves and dishwashers. You’ll need to decide on appliances prior to finalizing your kitchen cabinet layout and style choices. Have you thought about your usage pattern while cooking? This may seem an odd consideration at first, but it’s quite an important one. Think of what you do while cooking and of your pattern of movement in the kitchen. Typically, you’ll probably note that it’s a triangle between the stove, the refrigerator and your main counter area. The location of your pantry cabinet, the sink cabinet and your main cabinets supporting your primary prep surface need to figure into this equation. Quite often, when a new kitchen is being designed, the cabinet types and positions are based on the way the kitchen will look – and not on the way it will be used. We have seen too many new layout designs which end up being very much disliked by the user. Sometimes leading to another complete remodelling out of frustration. Not Using Professionals The notion that doing a complicated kitchen renovation by yourself is going to save you money is typically the number one mistake. Kitchens are complicated in design and in construction. There’s electrical, plumbing, cabinet work, flooring, painting, trim, stone or countertop work and lighting. These are all separate areas of expertise. It’s not recommended to tackle a complicated kitchen renovation job yourself unless you are actually an expert in each area. Plus, keep in mind that the most experienced kitchen renovation contractors themselves use dedicated expertise in each area. There’s a reason for that. Over or Under Improving a Kitchen Not considering what types and quality levels of kitchens typical homes in your area have can cost you dearly during a sale, and certainly in home value. You’l’ have to consider the typical style of home in your neighborhood, and typical stye of kitchen installed in them during any kitchen renovation. Venture too far out, and if you plan on selling and present a very different kitchen design than what potential buyers are expecting to see – they may pass on your home as a potential. If you take a cheaper than average route than your benchmark neighbors, then a potential buyer will plan on having to gut and re-do the kitchen. Any offer will reflect that reality. If on th other hand you over-improved the kitchen with your remodelling, no buyer will pay a premium for you having done that. Why? Because if they ever plan to sell, then they will not be able to expect any more than average market price either – no matter how fancy the kitchen is. Wasted Storage Space To some extent it’s impossible to avoid. 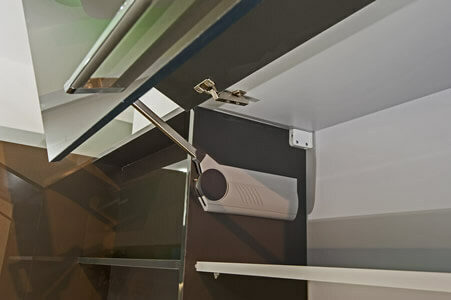 Many cabinet layout decisions result in a compromise of use and size, which means that there will be unusable space between, under, beside and behind some cabinet units. Just be aware of that and always look to minimize it. Inadequate Storage To avoid this one, make a careful list of what you’ll actually want to store in your kitchen cabinets. From small appliances to several sets of plates and cutlery, to pots, pans, and even spice sets. Not to mention several sets of glasses and cups. Perhaps even winter, sommer and special occasion sets. Then, discuss this with your kitchen designer. Inadequate Counter Space If you’re an avid cook, you probably won’t make this mistake. However, think of what function you do most of, and in what order. For instance, if you like to cook complex meals and use the counter as a “pot station” while prepping or lining up pots for timing the meal preparation, consider this: Add a six burner stove instead of using counter space! In general though, think through your counter usage patterns and focus on making sure that there’s adequate kitchen counter space where you need it most – and for the prep functions you do the most. Poor Lighting Lighting is rarely given the attention it not only deserves, but needs. Break up your lighting considerations into three categories. First, there should be enough general kitchen lighting to illuminate the entire kitchen properly without casting obvious shadows around your kitchen cabinets. Second, there must be adequate task lighting. Over prep areas for example, or over the island, above the sink, and so on. Consider what type of prep and other work and activity may be performed in the kitchen and make sure that there’s proper and dedicated lighting in those areas. Poor Ventilation No matter how beautiful a home or a kitchen is, if a visitor is blasted by the lingering smell of a meal prepared the night before, it will taint the kindest of opinions about your new kitchen remodelling efforts. Inexpensive range hoods just circulate the dirty and stale air in the home. Also, when the air from the cooking area is not exhausted effectively, the oil particulates in the air mix with any floating dust and settle on the cabinet vertical surfaces, and in all the small cracks around in the kitchen area. If your kitchen opens to a large living area, the problem will be compounded. Although relatively expensive, investing in a proper range hood will not only vastly improve the quality of the air in your home but make your home much more enjoyable while cooking.